Congratulations and big salute to all those leaders and workers who worked tirelessly and organised the most wide-spread and largely participated two days nationwide strike under the banner of Confederation, which is the vanguard of the Central Government employees movement. Central Government employees had created history again. The two days nationwide strike on 2019 January 8th & 9th was not only widespread but a thundering and magnificent success in all respect, surpassing all the recent past strikes in percentage of participation. Of course, there was weakness in some sections and in some areas, but that didn’t affect the overall success and impact of the strike. When the dominant leadership of the JCM National Council staffside and National Joint Council of Action (NJCA) ie., Railway Federations, are reluctant to go on strike against the betrayal of the BJP-led NDA Government on Minimum Pay & Fitment formula, NPS, Option-I of Pensioners, HRA arrears etc, inspite of the fact that Confederation and Defence Federation has authorised the Railway Federations leadership to serve strike notice reviving the deferred indefinite strike of 2016 July 11th, it is Confederation, Confederation alone, has shown its commitment to the cause of the 32 lakhs Central Government employees and 33 lakhs Central Govt. Civilian Pensioners, by organising two days historic strike along with the 20 crores workers of Indian working Class. Confederation organised one day strike on 12-12-2012 and two days strike on 2014 February 13th & 14th demanding appointment of 7th Central Pay Commission, One day strike on 16-03-2017 demanding scrapping of NPS and honouring of assurance given by Group of Ministers and one day strikes on 2nd September 2015 and 2016 along with the mainstream of the working class against the neo-liberal economic policies. 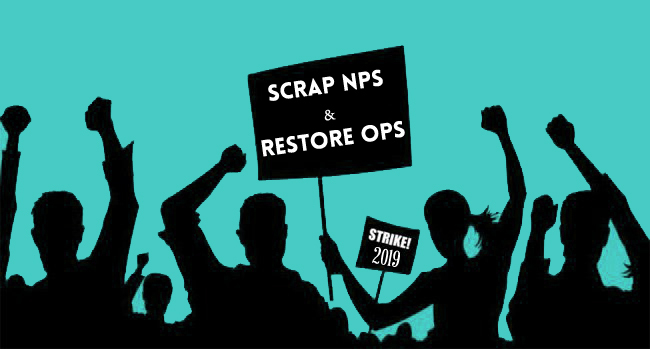 We decided to go on strike, demanding 10 points charter of demands of which the first and the main demand is "Scrap NPS & Restore OPS" in the mass convention of Central Government employees held at Hyderabad on 10th June 2018. Intensive campaign for the strike started from July 2018 onwards. The message of the two days strike went to every nook and corner of the country and reached almost all central Govt. Offices and employees including Gramin Dak Sevaks, Casual/Contract Workers and Autonomous body employees and Pensioners. We are proud that we have stood with the workers and peasants of our country as a class-oriented militant trade union and Confederation represents the hope and aspirations of lakhs and lakhs of Central Government Employees and Central Govt. Civilian Pensioners. Everyone of us is aware that it is the previous BJP-led NDA Government which introduced the NPS in 2003 through a Gazette Notification dated 22nd December 2003, to all new entrants recruited on or after 01-01-2004. We are also aware that the Congress-led UPA-II Government passed the PFRDA Bill in Parliament to legalise NPS, with the full support of opposition BJP MPs in 2013 and thereafter PFRDA Act came into effect from 18th September 2013. Only 43 MPs of Left Parties, TMC, JDU, BSP, SP & RJD opposed the bill in Lok Sabha against 125 votes of Congress & BJP. In Rajya Sabha 25 MPs opposed while 115 supported. Confederation along with All India State Govt. Employees Federation (AISGEF) conducted series of agitational programmes against NPS from 2003 onwards including National Convention, Parliament March, signature campaign and strikes. "Almost a whole lot of Central Government employees appointed on or after 01-01-2004 were unhappy with the New Pension Scheme. While National Pension System (NPS) did not form a part of our Terms of Reference; we have recorded the sentiments of the affected employees. The Government should take a call and step into to look into their demands". "The larger Federations and Staff Associations advocated scrapping of the NPS on the ground that it discriminate between two sets of Government employees. Individuals covered under NPS have pleaded for reverting to Old Pension Scheme (OPS) on the grounds of uncertainty regarding the actual value of their future pension, on the face of market related risks." Naturally, in tune with the recommendations of 7th CPC, when the NDA Govt. decided to appoint a High Level Committee called "NPS Committee", the Central Government employees, especially the younger generation, expected that their anxiety and concerns will be taken into account by the Central Government and NPS will be scraped and OPS will be restored. But the final decision of the Government not to scrap NPS but only to increase the percentage of contribution by the Government from 10% to 14% was a great blow to the NPS employees. Their hopes are shattered, "their legitimate aspirations are guillotined" and a situation is created where their "hopes ended in despair". "NPS is expected to provide old age income security to subscribers besides providing capital for the social and economic development of the economy". The final blow came when the NDA Government made its stand clear without any ambiguity in a reply dated 25-12-2018 given in Parliament stating that - "Representations have been received which inter-alia also include the demand that Government may revert to Old defined benefit pension system. However, due to the rising and unsustainable pension bill and competing claims on the fiscal, there is no proposal to replace the National Pension System (NPS) with Old Pension System (OPS) in respect of Central Govt. employees recruited on or after 01-01-2004". During the past 2-3 years many NPS employees, mainly Gramin Dak Sevaks and Casual Labourers promoted to departmental posts after 01-01-2004 (as their previous service is not treated as regular service) and also aged dependents of deceased employees who got compassionate appointment after 01-01-2004 etc, retired from service after completing 10 to 13 years service. Their Annuity Pension under NPS is Rs.700/- to Rs.2700/- maximum per month, thus confirming our apprehension that “NPS is nothing but No Pension System". Unlike the BJP led NDA Government at the Centre, certain State Governments understood the seriousness of the situation and they have declared that they want to scrap NPS. (Delhi, Andhra Pradesh, Tamilnadu during Jayaalitha’s time, Karnataka and Kerala Governments). Some of them appointed expert Review Committees to work out modalities for coming out of NPS. From the stand taken by the above State Governments it can be seen that it is the political stand of the ruling party that matter. At the centre, it is the political stand of the Political Party ruling the country which is crucial. After the continuous struggle by Confederation including strikes from 2011 onwards, the then UPA Government was compelled to announce appointment of 7th Central Pay Commission. Gujarat State Government objected the decision of the UPA Government to appoint 7th CPC. Shri. Narendra Modiji was the Chief Minister of Gujarat at that time. After coming to power at the Centre in 2014, the BJP led NDA Govt. made deliberate attempt and intervention to delay and deny the legitimate demands of the Central Govt. employees and Pensioners including the demands relating to Minimum Pay, Fitment Formula, HRA from 01-01-2016, Option-I for pensioners etc. When the entire Central Government employees ,under the banner of National Joint Council of Action (NJCA) decided to go on indefinite strike from 11th July, 2016 a Group of Cabinet Ministers including Shri. Rajnath Singh, Home Minister, Shri. Arun Jaitley, Finance Minister and the then Railway Minister Shri. Suresh Prabhu, gave categorical assurance on 30-06-2016 that Minimum Pay and Fitment formula will be increased and for that purpose a High Level Committee will be constituted. Even after a lapse of 2½ years neither High Level Committee was constituted nor Minimum Pay and Fitment Formula is increased. "The fitment factor for the purpose of fixation of pay in the revised pay structure, based on the recommendations of the 7th Central Pay Commission is 2.57 which is uniformly applicable to all categories of employees. As the same is based on the specific and considered recommendations of the 7th CPC, no change ,thereon is envisaged". "It should always be borne in mind that legitimate aspirations of the employees are not guillotined and a situation is not created where hopes end in despair. Hope for everyone is gloriously precious and that a model employer should not convert it to be deceitful and treacherous…… A sense of calm sensibility and concerned sincerity should be reflected in every step. An atmosphere of trust has to prevail and when the employees are absolutely sure that their trust shall not be betrayed and they shall be treated with dignified fairness, then only the concept of good governance can be concretized. We say no more". The NDA Government has "guillotined" our aspirations. NDA Govt. has betrayed the employees and Pensioners and created an atmosphere where "Hopes ended in despair". NDA Govt. converted our hope to be "deceitful and treacherous", "Dignified Fairness", "Calm sensibility" and "Concerned Sincerity" in treating our case is lacking on the part of NDA Government. Hence we have no alternative but to defeat the betrayers in the coming biggest battle of democracy. Regularisation of Gramin Dak Sevaks and Casual/Contract Workers. Implementation of the remaining favourable recommendations of Kamalesh Chandra Committee on GDS. Grant of HRA arrears from 01-01-2016, removal of bench mark for MACP and grant of promotional hierarchy and date of effect of MACP from 01-01-2006. Fill up of all vacant posts. Reintroduce Regional Recruitment for Group B and C Posts. Implement Option-I formulation of 7th CPC for Pensioners. Settle anomalies arising out of 7th CPC. Parity in Pay scales between Central Secretariat Staff and similarly placed staff working in field units of various departments. Withdraw closure orders of Govt. of India Printing Presses. Stop closure of Govt. establishments and outsourcing of Govt. functions. Stop proposed move to close down salt department. Implement 7th CPC Wage Revision and Pension revision in remaining Autonomous bodies. Grant Bonus to Autonomous body employees pending from 2016-17 onwards. Remove 5% ceiling on compassionate appointment and grant appointments in all deserving cases. Grant five Assured Career Progression to all Group B and Group C employees. Stop attack on Trade Union rights. Ensure prompt functioning of all JCM forums. Withdraw the draconian FR 56(j) and Rule 48 of CCS (Pension) Rules 1972. “It is a common say, particularly among the Government employees that the Unions should remain aloof from the politics. All the confusion has arisen because of the fact that the correct definition of the "Politics and Trade Union" has not been understood by most of us. Those two things are not separate from each other rather they are inseparable. Politics do not mean the policies of a particular political party. Each and every demand of the Govt. employees is linked with the politics of the country. It is high time that the age old confusions be removed from the minds of the Govt. employees and their unions. Collective thinking on the problems of life in the context of a nation is a fundamental right of every section of the people and therefore, the Central Govt. employees cannot be deprived of their birth right on the plea of "Political influence". It is in the above background, we have to take position in the coming General Elections. Our experience during the last five years have proved that BJP-led NDA Government is the most anti-worker and anti-people Government the country had since independence. This Govt. is by the corporates, of the corporates and for the corporates. The working class, including Central Govt. employees, should be made aware of this challenge and prepared to defeat it. It should be kept in mind that defeat of this Government is not the end, but our struggle for reversal of the neo-liberal policies has to continue with increased vigour even after ensuring defeat of the anti-worker government. In any case, continuation of this Government is against the interest of the working class, especially the Central Govt. employees. Change is the need of the hour. As a class-oriented militant trade union, it is our responsibility to channelize the discontentment and anger of the employees on proper direction with the objective of strengthening united struggles to defeat the neo-liberal policies and ultimately pave the way for taking the struggle towards an exploitation free society. Let us make 2019 that started with the two days historic strike, a year of heightened struggles leading to decisive struggles against the neo-liberal policies. Let us be prepared for a bigger struggle in coming days to “SCRAP NPS & RESTORE OPS” and also for the realisation of our long pending demands. Let us not forget that the ruling class may use all tricks at their command, all weapons in their armoury to divert the attention of the people and workers, away from their burning day to day livelihood issues, to divide and disrupt their unity to engineer polarisation of the society on caste and communal lines for their electoral gains. We should be prepared to defeat all such machinations and should preserve our unity. "Change does not roll in the wheels of inevitability, but comes through continuous struggle, and so, we must straighten our backs and work for our goal."